Recently, Dark Starr and I headed into deepest, darkest Chicago to the House of Blues to check out Dio in concert. Despite being made to feel like pariahs by the fatuous H.O.B. staff, we watched a great artist in full command of a rabid crowd. 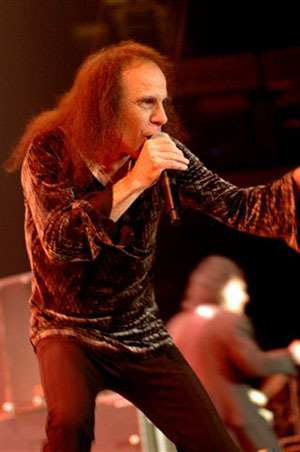 It was truly a killer show that featured all the Dio classics like "Rainbow in the Dark," "We Rock" and "Stand Up and Shout;" as well as virtually all of "Magica" and tidbits form Ronnie's tenures with both Rainbow and Sabbath. Despite much trial and tribulation, we briefly met the man and his band at a bleary-eyed 3:00 am. The wait was worth it, as Mr. Dio proved to be an incredibly nice guy who promised to call me up and do an interview. And by God, that is just what he did. Read on, humanoids, and 'hear' the wizard speak! Wormwood Chronicles: Ronnie, let me start by thanking you for all the enjoyment that I've gotten out of your music over the years. Ronnie James Dio: Thank you, thank you very much. WC: Has your tour with Yngwie and Doro wrapped up? RJD: Yes, it has, We finished up on Dec. 16, in Orlando. WC: How did that go? RJD: Great, (It was) absolutely wonderful, It was a wonderful package. Doro was great. Yngwie blazed away all the time. It did great business throughout the country. We had a lot of enjoyment doing it. Everybody got along really well. It was one of my favorite tours, if not my most favorite. WC: The night I saw the tour in Chicago, you came out and played three encores. Was that a typical night or was it a special show for you? RJD: It was probably longer than what we do most of the time, but as long as there's no curfew and we're having a good night and a good time, we will do everything we can do, about 23 songs in all. WC: After all the time that you have been in the music business, does the urge to perform still burn as bright for you? RJD: Absolutely, it's really why I do what I do. the best time of your life as a performer is being on that stage. The phone can't ring, you don't have to take out the trash. This is your time, your special time; that's what it's all about to a musician. The rest of the stuff, you just have to put up with. WC: So the work in the studio, the actual creation of the music, is secondary to the live aspect for you? RJD: Well, I like to create the music but I think it becomes unnecessary. It's almost like if you don't make the album, you don't tour and you get caught up in that. There are times when I enjoy the writing process and there are times when I don't, when it gets difficult. the recording process is the same. When it gets difficult, it's not enjoyable. But if the last album we did is any example, it should be easy for us. This was the easiest album to work on I've ever been connected with as far as writing, recording and playing. It's just been amazing. but generally, the reason for recording is just to get on the road. WC: Your latest album "Magica" is a very involved concept piece. Did you come up with the story in a burst of inspiration or were these ideas in your head for years? RJD: The only idea that had been in my head for years, and probably only three years at that, was the word, magica. I saw that word on the internet and went, "whoa, what a great word that is... I can do something with that!" So, for three years, it languished in my mind, but when I decided to make this concept album, I chose to call it, "Magica." everything started with just that word, before any concept was created, the difficult part was figuring out what magica was going to be. I started writing the story and once I wrote the story, the songs came very easily. the title came first, then the story, then the songs. WC: "Magica" reflected your return to more fantasy based lyrics. Your previous album "Angry Machines" tried to deal more with contemporary topics. I gather from what you've said, it was easier writing the fantasy lyrics? RJD: It was, because of my writing style. The fantasy lyrics are more open to interpretation. When you're talking about contemporary social issues, those are hard to describe with fantasy lyrics. I find contemporary lyrics hard to write because they don't seem to have a lot of beauty to them. They are just stark statements. I like things that are colored with a lot of metaphors and analogy. WC: It's hard to use metaphors if you're describing an urban crack problem. WC: Your lifelong fascination with medieval and fantasy subjects, was there a specific book, movie or story that sparked that for you? RJD: The first book that I remember reading that had anything to do with that was, "The Black Shield of Falworth" by Sir Walter Scott. It started me off on my 'knight search.' Then, I read a lot of Arthurian tales and a lot of science fiction. I loved the way that they wrote; the way I had to use my imagination. Fantasy is not something you can hold in your hand. Much like religion, you have to use your imagination. Because of that style, I tend to use more flowery terms to describe things. WC: Your lyrics also tend to be very inspirational or very gloomy. Would you say you're manic-depressive in your lyrical outlook? RJD: Not being a psychiatrist or a psychologist, I can't tell you if what I do is symptomatic of that. You need to write things that are opposed to each other or everything will be the same. Once you're exhausted one side of your personalily, you need to explore the other side because it seems new to you. I'm positive that allot of things that I have written have mirrored my feelings at the time that I wrote them. WC: For example, "Rainbow in the Dark" was a very uplifting song and on the same album, "Invisible" seemed to be pessimistic. RJD: "Invisible" wasn't meant to be pessimistic, it was meant to describe three problems that people have. It was meant to describe the problems of a young boy; the problems of a young girl; and the problems of me, because I am the character in the third verse. It was just meant to be an observation on life because that is really what I'm always writing about, my observations on life. WC: So it was actually pretty objective? RJD: I think so, yeah. I think what it was trying to say to people who didn't suffer these problems, maybe you should think about what other people go through. WC: Over your long career, who were some of the favorite musicians you worked with? RJD: I have to cite most of the guys I've worked with over the years. Tony Iommi and the guys in Sabbath, I loved all of the guys in that band. The guys in Rainbow, too. My first three albums, I loved working with those people. I loved working with Vinnie (Appice, drummer in both Sabbath and Dio). I enjoy working with the guys in Deep Purple, because I've known them for such a long time and because they were so inspirational to me when I was growing up. They played the music I wanted to play.I'd also have to say all the people who worked on the Hear'n Aid project with me (this was an album by a metal allstar band where all profits went to charity-Dr. Mality) not just because they were great musicians but because they were great people, period. I guess my answer is there's a hell of a lot of good people out there. WC: Will you be doing another Hear'n Aid project? RJD: Yeah, we're going to do another one. The single is written. Like the previous one, it will include different singers and guitarists. Then we'll have an entire album. We're also re-releasing the first one on CD, it was only on CD in Japan up until now. WC: Is there anybody that you would like to work with that you haven't, yet? RJD: I honestly don't sit around and think to myself, "I'd like to do something with that person". I think it's because I've already chosen the people I want to work with. I have to show loyalty to the people I work with. I think you can get so much more out of someone who's your friend as well as a great player. There's not a guitar player out there that I'd rather play with other than Craig Goldie nor a bassist other than Jimmy Bain or a drummer other than Simon Wright. But if I had to pick somebody, I'd say Jeff Beck. He's such a great musician, head and shoulders above everybody else. WC: Is the band you have now the ultimate Dio band? RJD: I'd like to think so. Yeah, I think it is, yes, I do. WC: It seemed to be a well oiled machine on stage. RJD: It's a great machine. Not only is it a great machine, it is a happy machine. I think everybody who comes to our shows realizes what a great time we have on stage. It's such a plus when you love to play together. WC: What's been your biggest Spinal Tap moment? RJD: Yeah, we've had a couple of those. Now when I was in Black Sabbath, we had a giant cross that was made of broken mirrors with a track of lights that would chase around it. This was when we were touring with Blue Oyster Cult on the "Black and Blue" tour. We wanted to do something special with the cross because this was in Madison Square Garden. We had BOC's pyro guy rig the cross up so it would catch on fire real dramatically. "OK," I said to the audience, "we're going to do something really special now" and I went into this big spiel trying to get the crowd psyched up. "I'm gonna count 1-2-3 and when we get to 3, raise your fingers up in the devil sign, something¹s going to happen." So we count down 1...2...3, with 20,000 people in the audience. And then the cross goes "spfff... sputter... pop... fizzzz." And, that was it. That was so embarrassing, that was a great Spinal Tap moment. WC: I was actually at the Black and Blue gig when it came to Rockford Speedway in 1981. RJD: I remember that gig very well, it was a great gig. WC: Now I remember a point where Tony Iommi played a solo for about a half hour and you kind of disappeared. RJD: I think we were in our self-indulgent period at that point. But what I remember about Rockford is people had these covers that went on tubs of beer. They were flying everywhere, like little frisbees and the stage was literally covered with them. We stopped the show for a minute, I went back and got a broom, which got a round of applause. That was a cool gig, those were good times. WC: What was the last CD that you bought? WC: Any final messages, Ronnie? RJD: Not really, except keep an eye out for the new Hear'n Aid project. And we're going to do another Dio album with this same band, it will be the second album in the "Magica" trilogy. WC: I couldn't thank you enough for taking the time to talk to us today. RJD: It's been my pleasure.